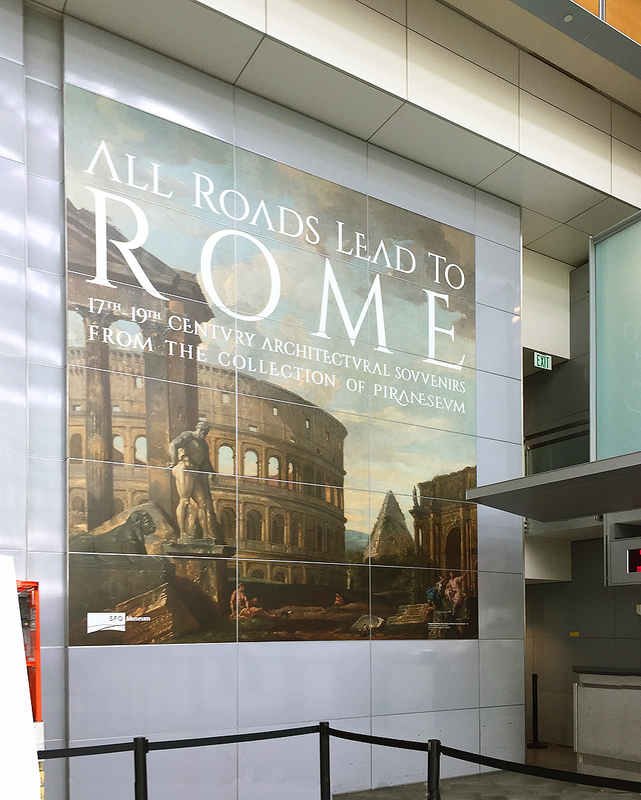 "All Roads Lead to Rome," an extensive exhibit at San Francisco Airport's International Terminal, lifted off on Saturday, March 11, with a big, Italian styled opening. 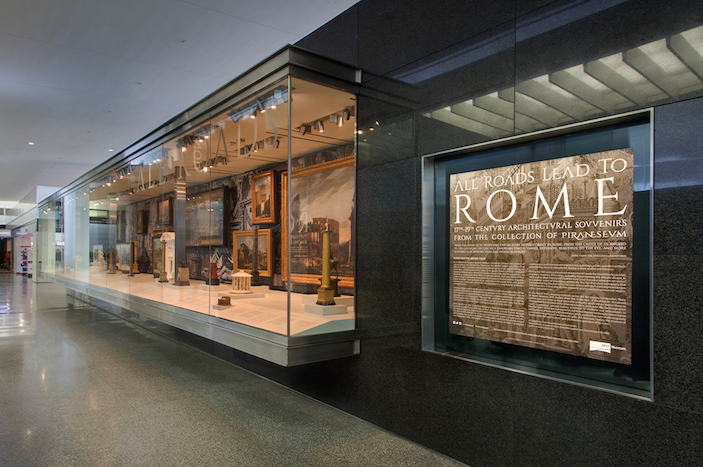 The Italian Consul General, Lorenzo Ortona, talked of the connections between Rome and San Francisco, while Piraneseum partner, Lucia Howard gave an introduction to the show. With prosecco provided by the party's sponsor, the Institute of Architecture and Art (ICAA), and Italian refreshments provided by CoorItalia, the stage was set for appreciation of the Italian art and objects shown in "All Roads." The SFO Museum pulled out all the stops with this exhibit, subtitled "17th - 19th Century Souvenirs of the Grand Tour from the Collection of Piraneseum." From magnificent old master paintings to the world's largest collection of architectural models of the Grand Tour, "All Roads" assembles a set of 78 objects that have never been seen together on such a scale. Yet all were produced during a similar time, in a remarkable period of artistic production sparked by wealthy travelers taking the Grand Tour. 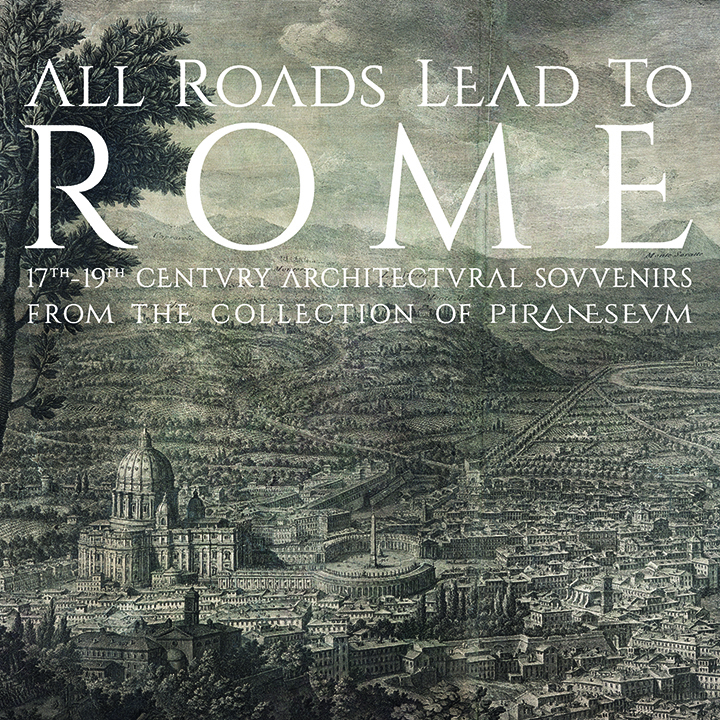 With the Grand Tour, in the 17th - 19th centuries, all roads did in fact lead to Rome. Well-to-do European and later American tourists traveled through a number of European cities, but the ultimate destination was always Rome, where they would often settle in for weeks or even longer. Artists and architects came to Rome as well to learn from Italy's spectacular past, taking home these lessons to profoundly influence the art and especially the architecture of cities all over the world. Yet this period of primarily 18th c. fine art and 19th c. architectural objects is little studied, with the connections between its paintings and etchings, sculpture, and decorative arts essentially unrecognized in the world of Art History. Artists in this period were often tempestuous, and highly competitive. "All Roads" delves deeply into the remarkable histories of the painters and artists whose work is included in the show. The commentary describes murder and suicide along with close connections between the artists. The sculptural objects too often have stories to tell. Grand tour pieces in the show have been assembled from as far away as the Philippines and Australia. Several of the larger pieces have a more complex history, their purposes beyond that of souvenirs. The party concluded with guided tours of the exhibit, located in the center of the International Terminal, where it will remain on display through August 13, 2017. The SFO Museum has produced a beautiful printed catalog of the exhibit which can be seen online here.